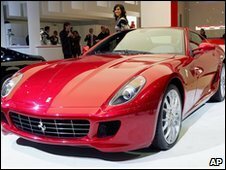 The man was reportedly caught driving a red Ferrari Testarossa at 137km/h (85mph) through a village. The penalty was calculated based on the unnamed motorist's wealth - assessed by the court as $22.7m (£14.1m) - and because he was a repeat offender. It is more than double Switzerland's previous record speeding fine - handed to a Porsche driver in Zurich in 2008. In the latest case, the motorist was clocked speeding 57km/h (35mph) faster than the limit, according to the cantonal court in St Gallen, eastern Switzerland. "The accused ignored elementary traffic rules with a powerful vehicle out of a pure desire for speed," the court said in its judgement. Swiss media reported that the man owns a villa with five luxury cars, including the Ferrari.